Walt Disney World is going to be celebrating 45 years in 2016. A lot has changed over the years and not just increased admission prices; we’ve lost attractions, lands, restaurants and philosophies. Yes, even philosophies. Part of what I love doing is scouring old Walt Disney World publications and photographs to decipher changes and record what history I can. Something that most Disney enthusiasts recognize is the lack of historical record for Walt Disney World. Disneyland is one of the most well-documented places in history by the Disney Company and by us regular people. Walt Disney World is not. 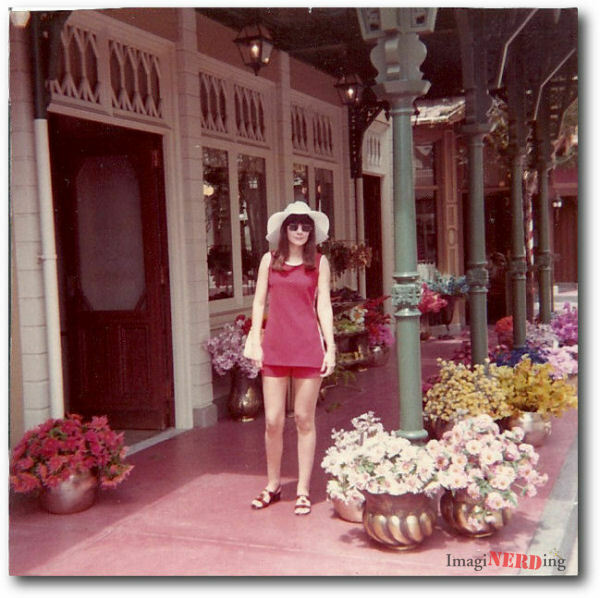 A good friend shared his early Walt Disney World photos and it included a few from his parents’ first trips in 1972 and 1973. What caught my eye was the one of his mom standing on Main St. while surrounded by flowers. I knew this image featured a section of the Magic Kingdom that had been lost for a few years. As you head down Main Street USA, you come to a side street on the right-hand side that is known as East Center Street. As you glance to the left, you notice an entrance to the Emporium. Weird, right? Where’s West Center Street at the Magic Kingdom? Well, in 2001, an addition to the Emporium was created that took over the entirety of West Center Street and forced the shopkeepers to close down or relocate (like the Harmony Barber Shop). Let’s do some theme parkeology and look at what we are missing. 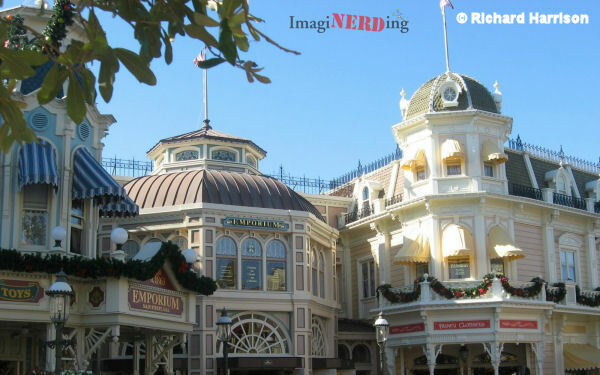 In the Imagineering Field Guide to the Magic Kingdom, Alex Wright discusses the story behind the Emporium. The shopkeeper has found success on Main St. and was able to expand his business. The original Victorian space has always shown signs of opulence in the finishes and the fixturing, such as the combination gas and electric chandeliers-the electric lamps point down, the gas lamps point up-a tremendous extravagance during this era. The expansion revealed the ways the proprietor has been spending his money. The architecture is intended to reflect influence brought back a few years later, circa 1903, from Europe, revealed in Edwardian style. This shows itself through the lighter woods and pastel color scheme, contrasting with the heavier woods and reddish tones of the pre-existing space. What’s Gone from West Center Street at the Magic Kingdom? 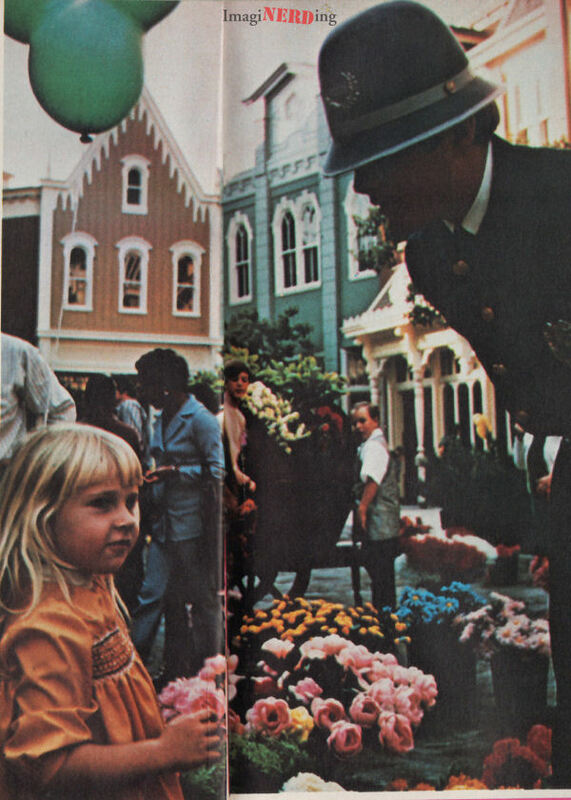 The next image is from a 1974 GAF Guide to the Magic Kingdom and gives us a breakdown of the shops on Main St. 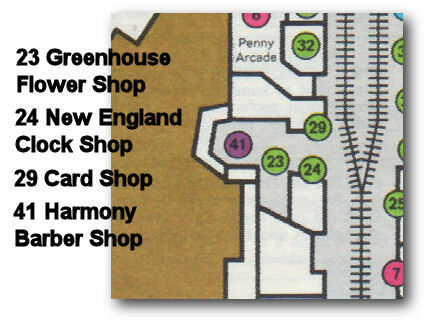 It is also fascinating to study the guide because you can see the (not-to-scale) dimensions of the shops. Along West Center Street at the Magic Kingdom, there were also facades for a Chinese Hand Laundry, a Livery and Champion Cyclery. 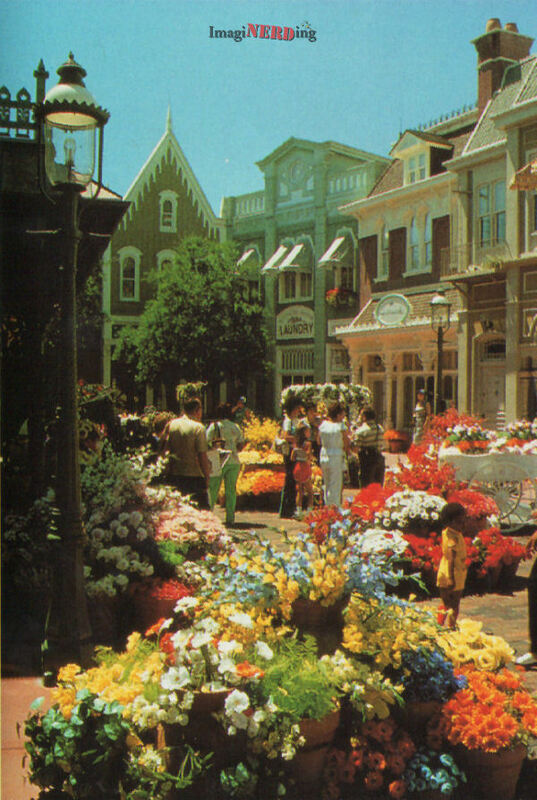 We actually lost the Greenhouse in 1984 during the Emporium’s first expansion even though the store front remained. The following images are the few that I could find in my 900 book library. There are also very few images available online from family vacations. Maybe more will start appearing over the next few years. Or you could just send me your photos! A fantastic image from April 1975 courtesy of DaveLand. This shot was used in several pictorial souvenir guides. From the 1987 Walt Disney World and EPCOT Center book. 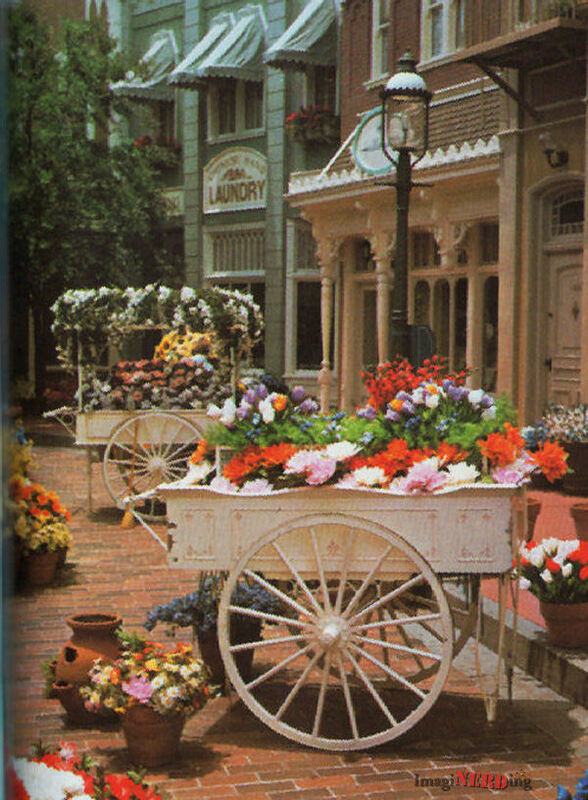 From the 1994 Souvenir Guidebook. It is one of the largest photos of West Center Street I have ever seen. From the 1993 paperback pictorial souvenir guide. Ian Parkinson sent in this great photo from 2000. Although it’s very nice to be able to walk in air conditioning on the west side of Center Street at the Magic Kingdom, it still feels like a big loss for the 1971 Magic Kingdom. 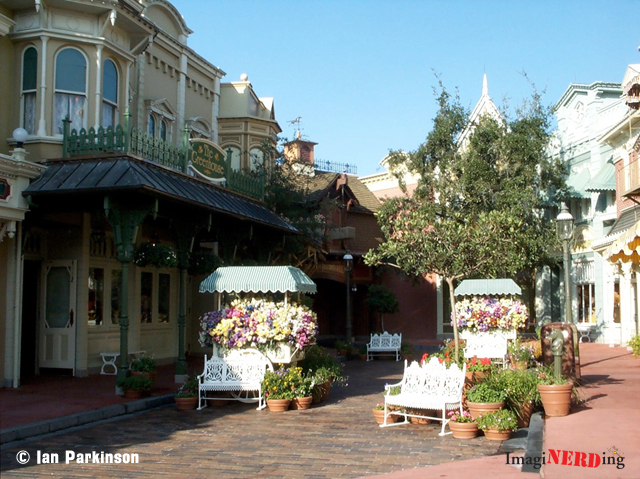 The Imagineers did a beautiful job, inside and out, but I loved the charming little area that sheltered the shops. Do you have any memories or photos of West Center Street? What do you think about the expansion of the Emporium which took over the entire West side of Center Street, destroying the smaller themed shops? The Mega Emporium feels out of scale for an old town. It just seems like any other modern department store, granted a high end one, but I see lots of department stores like that outside of Disney World. 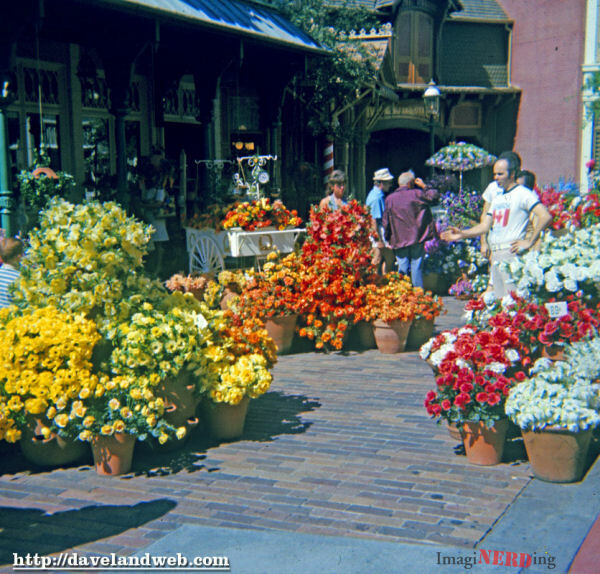 The little shops along West Center Street were far more “on theme” for Main Street USA. 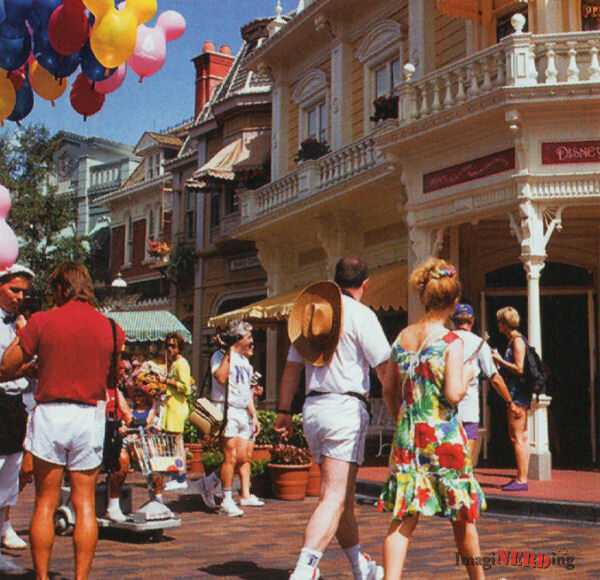 Sadly, a thematically appropriate shop was less valuable than a real modern store to 1990s Disney. 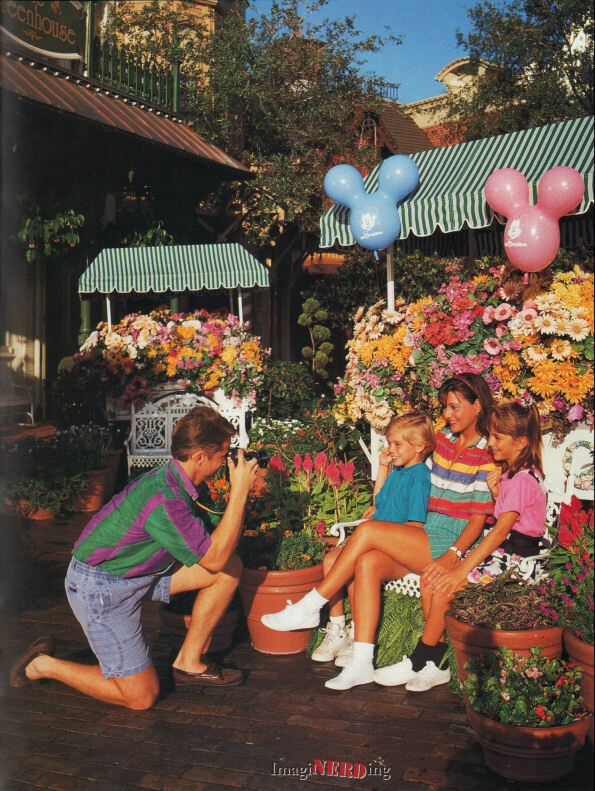 I have pictures sitting on the bench, in May 1984, when I was 10, on my first trip to Walt Disney World. I miss all of those lovely details that have been removed. To be able to go back in time and appreciate those now-gone attractions and details would be amazing! Let me know how to send a picture to you.